when I was a child my grandma, mormor kerstin, use to make pannkakor (swedish pancakes) every monday for me and all my cousins. i loved pancake mondays, not only because my grandma makes the best pancakes, but also because i loved being at my grandparents house. 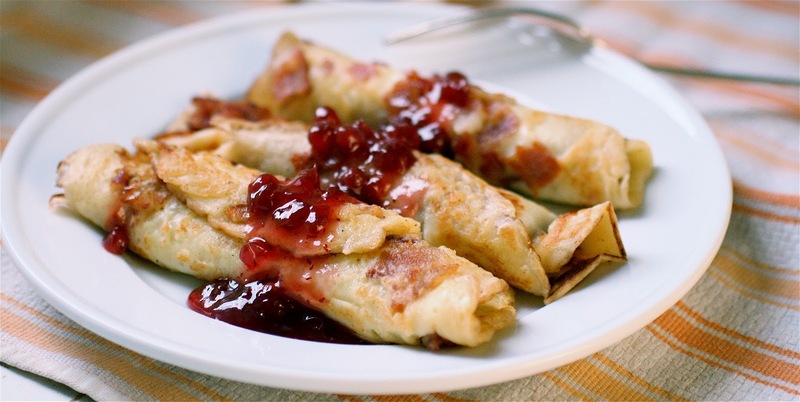 yesterday sweden celebrated these delicious pancakes, it was pannkaksdagen (the pancake day). so today (a day to late, i know) i thought it would be great to both celebrate my roommate michelle's birthday and the pancake day by making everyone in my apartment swedish pancakes for breakfast. ... and then my grandmas secret ingredient, around 3 msk carbonated water. gives the pancakes a little crust on the edges. 1. mix flour and salt. pour half of the milk in the dough and mix it to a smooth dough. 2. pour the rest of the milk and then the eggs in the dough (and the carbonated water). 3. let the dough rest for around 30 minutes (if you got the time). pour the melted butter into the dough. 4. take a frying pan and ad butter. when the butter is melted pour around 1/4 - 1/2 of a cup of dough in the pan (depending on your pans size). when the dough is still, flip the pancake. eat them warm with raspberry-, strawberry or any other kind of jam that you love. ad a scoop of vanilla ice cream or whipped cream to make them extra tasty. making swedish pancakes for the first time can be tricky, especially because they are very thin and therefor fragile. you can try to take less milk and/or little more flour if you find that the pancakes are hard to flip. also, don´t forget to let the dough rest for 30 minutes before making them, it makes the whole flipping process a lot easier. my family normally eats swedish pancakes for dinner. we have soup as the main dish and then we enjoy some of my mom´s delicious pancakes (almost like a desert). 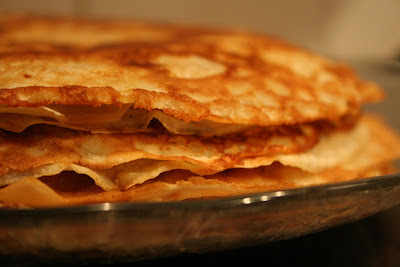 another thing you can do with swedish pancakes is pannkakstårta (pancake-cake). you just take one pancake (fold it out) put cream on it. then you place another pancake on top of the creamed one and put raspberry jam on it, then another pancake and you put cream on that one... you continue doing this until you have a pile of pancakes. put fresh raspberries on top of the pile and then some powdered sugar over it, looks great, is easy to do and taste like heaven. ps. great for birthdays parties. there are so many other things you can do as well, check out this webpage: http://www.pannkakor.se/ to get some ideas. ps. forgot to take pictures of the pancakes I made this morning (was to hungry=). so the pictures are from two other blogs http://www.thebittenword.com/thebittenword/2010/10/swedish-pancakes.html and bjorkman.blogspot.com. Looks amazing....My wife and I are def going to try this!